radishes, along with sculptured potatoes. THE STEAK TASTED OF CAMPFIRE, the salad of dewy garden, the peaches of lazy August afternoons. As we sat in a dining room with the hand-wrought, Spanish Colonial design ethos of legendary architect John Gaw Meem, the sound of our mmm’s was interrupted only by the occasional crowing of Albert, the pure-white peacock guarding the nearby bocce-ball court. Diners at Los Poblanos Historic Inn have come to expect these sensory smorgasbords. 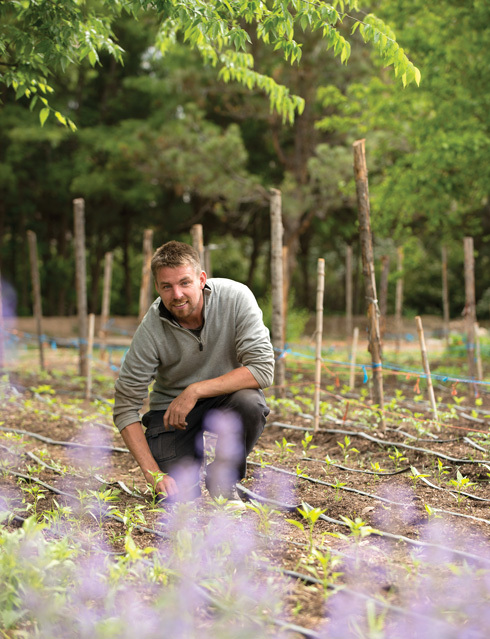 After parking next to the kitchen gardens, they wander beneath towering trees and past a perfumed rose garden before settling in to Chef Jonathan Perno’s carefully constructed breakfasts and dinners. 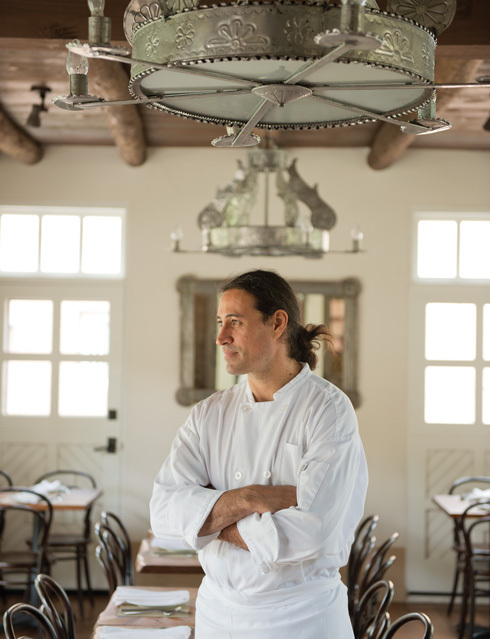 For seven years, this native son of the North Valley has transformed his decades of training under some of the world’s best-known chefs into a true farm-to-table invention that he calls Río Grande Valley Cuisine. puts an innovative edge on the farm-to-table trend. That’s saying something for a man who worked in fertile California, specifically in San Francisco, under Wolfgang Puck at Postrio and Alain Rondelli at Splendido, before logging time in Colorado, Utah, Paris, and London. While learning a library’s worth of skills, he also bore witness to the bad behaviors and burnout factors that can doom even the best of chefs. Coming home to New Mexico in his forties (he’s now 50), he pulled commendable duty at restaurants like Scalo Northern Italian Grill in Albuquerque, but also grew comfortable with his own humility and a desire to be a more evolved kind of chef and teacher. In the 1990s, owners Armin and Penny Rembe and their son, Matthew, began turning their 25-acre property near the Río Grande into a gracious, 20-room inn featuring art and architectural details by the likes of Peter Hurd and Gustave Baumann. Its early incarnation offered no on-site dining, but on a 2009 visit to scout its catering potential, Perno imagined how splendid it might be to work there. Just weeks later, Matthew invited him to try out his skills with a live cooking demo. Snug in a kitchen once built for a small family, Perno managed to deliver a six-course meal that won him a full-time job. For each of the past three years, he’s joined the semifinalist ranks in the regional James Beard Awards. Working with the inn’s kitchen farmer, Fergus Whitney, he maps out what crops to grow, including his staff’s gleanings from 25 types of fruit trees—peaches, apples, figs, jujubes, and mulberries, to name a few. He seeks out other growers in the valley and beyond and revels in ingredients like rancher Antonio Manzanares’s free-range, organic lamb raised in Los Ojos. 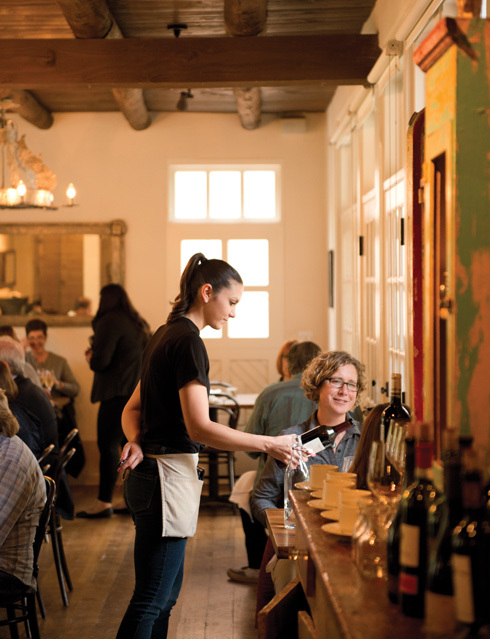 Diners settle in at Los Poblanos&apos; in-house restaurant. By late summer, the pickings give him a wealth of options. 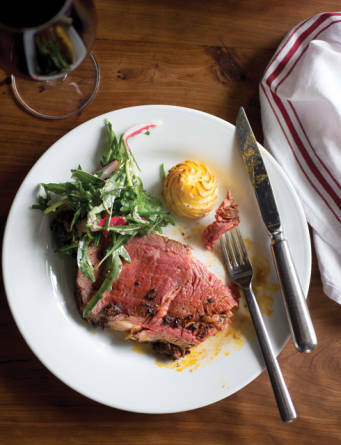 For his steak dinner, he rubbed the meat with an achiote paste of robust spices that the inn is developing for sale in its Farm Store, building on a sous-chef’s family recipe. 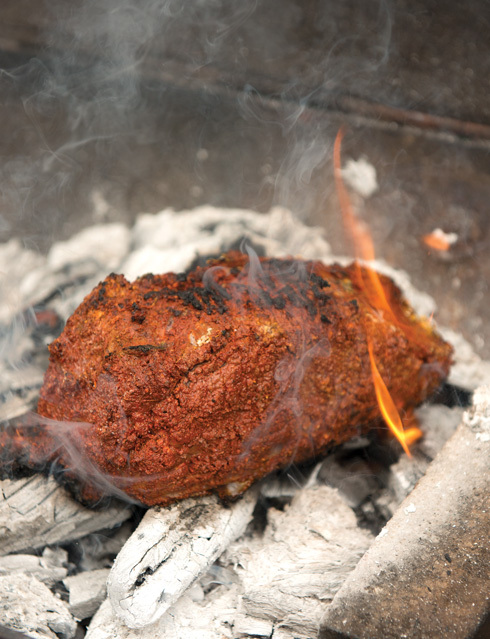 He charred it outdoors over wood-fired coals to imbue it with that hint of campfire before finishing it in an oven. 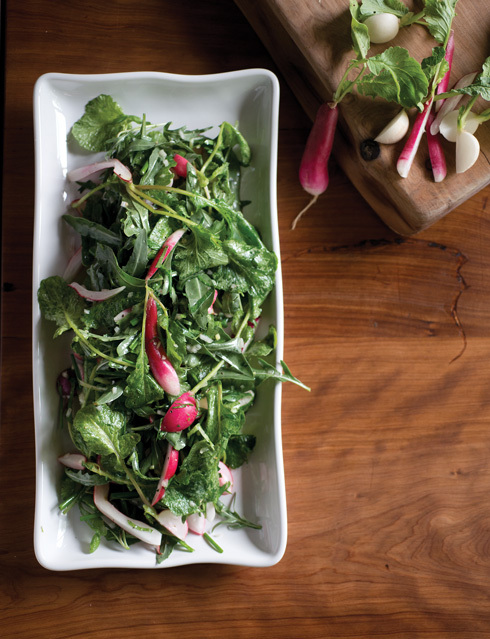 A salad of heirloom radishes and peppery arugula brightened the musky palate, with sculptured mounds of garlicky potatoes providing a mellow bridge between the two. Other menus celebrate the chef’s homemade charcuterie, pastas with garden produce, duck rillettes, and an ambitious preparation of pig’s trotters stuffed with a chicken-and-mushroom mousseline. To extend the season, he and his kitchen crew put up canned preserves and freeze, dry, or store everything they can. Some of their products are available from the Farm Store, along with the inn’s lavender-infused bath and culinary items. Farmer Fergus Whitney checks on his crops. Beehives and compost piles beyond the kitchen garden demonstrate the inn’s commitment to organic farming, and Perno’s tricks for avoiding burnout demonstrate his commitment to being a chef with staying power. Los Poblanos Historic Inn offers breakfast 8–10 a.m. daily, dinner 5–8 p.m. Wednesday–Sunday by reservation. Fill a 4-quart saucepan with water a quarter of the way up the pot and bring to a simmer over medium heat. In a mixing bowl wider than the pan, combine the egg yolks and sugar and beat on high until the mixture is a thick, pale yellow and the sugar has completely dissolved, about 4–5 minutes. Set the mixer to low and add the marsala and salt. Cut the peaches in half, remove the stone, and cut the halves lengthwise into sixths. In a mixing bowl, toss them with the sugar, lemon, cinnamon, and salt. Place in the refrigerator for up to 1 hour, tossing again 2–3 times as the fruit releases its juice. 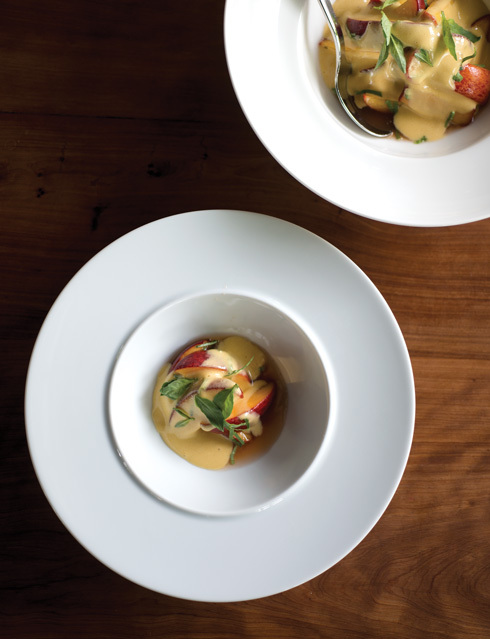 To serve, place peaches and juice in a serving dish, top with the zabaglione, and garnish with fresh basil.